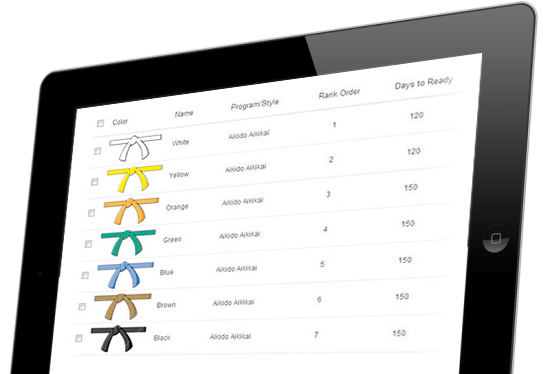 No matter what style of martial arts you teach, our simple and customizable rank management system fits your dynamic curriculum and automates your belt testing. Relieve the pains of belt testing, like figuring out who is ready for testing at the time of your next promotion or what size belts to order -- our intelligent belt and rank management will take care of it all for you. Automate students' rank readiness based on the length of time a student has waited, number of classes attended since last exam, or both time and attendance for a better result. Specify stripe and rank progression (stripes per belt, days before student is ready). Rank promotion has never been so quick and easy! Promote students based on exam attendance or all at once. Three levels of readiness determined by rank, and the ability to edit a student's level of readiness manually at any time, let you manage your student promotions with ease. With one click in less than three seconds, you can promote your students directly from the mat after their testing and print their certificates.